There are various layouts and sizes for your final print depending on what you would like to do with them. 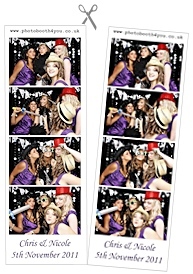 The traditional PhotoBooth Strip is your choice when composing a Guestbook. A duplicate strip on 8” x 6”, the print is cut in half with one half given to your guests, the other half secured in your Guestbook. We encourage your guests to then sign their name and write a personal message beside their print in the book. Printed on 6” x 4” paper, the Image Montage is a great gift for your guests and don't forget, you get all these Images and 4 photo layouts on disc for you to enjoy later. All of the layouts can have your custom message, text, date or name. Whatever you want to say, the text is all cutomisable at no extra cost.